One thing is for sure, Zambeza’s Power Kush in the feminized version rightfully earns her name. This powerful Kush is loved by many because of her heavy-hitting indica high and her fantastic sweet and sour Kush flavours. Making an autoflowering variant of this great Kush seemed like the logical thing to do. Get ready to grow some top Kush bud in a super-short 55-60 days from seed to harvest! No one would want to waste excellent genetics and this was exactly the reasoning why Zambeza set out to make an autoflowering version of their superb Power Kush. Like her feminized sister, Power Kush Autoflowering is able to grow some serious Kush bud with the awesome trademark Kush flavour, but now so easy that really everyone can look forward to some fine Kush bud in record time! With a short life-cycle of only 55-65 days from seed to harvest, Power Kush Autoflowering is suitable for even the most impatient growers. Her yields of up to 400g/m², put her right there in the middle, not breaking records but still making for some good amount of Kush goodness for an autoflower! With a height of 80-110cm, she will stay nicely manageable as well. Grown outdoors, she can yield as much as 105g per plant where she can grow a bit taller, up to 150cm. Her rather compact size that she has thanks to her indica genetics make her also a good choice if you want to keep your grow hidden from prying eyes. Power Kush’s Autoflowering THC levels have been measured a moderate 14%. While this might not look too spectacular on paper at first, be assured that she’ll deliver a very powerful and happy indica effect that is excellent to boost your creativity nature! Because of the awesome creative Kush high, it’s no surprise that she’s often the smoke of choice for many artists and musicians. Her aroma is equally outstanding, with a perfectly complimenting contrast of sweet and sour notes with some subtle hints of spiciness mixed in. Power Kush’s Autoflowering will make for an awesome Kush smoke that will satisfy even the most seasoned cannabis smokers. And the best thing about her is that she’s super-easy to grow so that even new growers can see results fast! 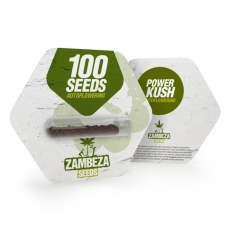 Zambeza did a fantastic job bringing us an autoflowering variety of their Power Kush. This is an auto that grows easy and almost without any compromises, with the same great taste and awesome Kush high like her bigger sister. For new cannabis growers but also for experienced cultivars who simply love autoflowers for their convenience, Power Kush Autoflowering bulk seeds available in packs of 100 seeds are a very good choice if they want to grow a phenomenal Kush in record time!